Please be advised that the United States Court of Appeals doesn’t have a Twitter account or any other social media account. We have become aware that a Twitter account was created, impersonating the Federal Circuit. We are actively working with Twitter and the authorities to deactivate the account. If you believe there is an account fraudulently operating as the Federal Circuit , please report the fictitious social media account to the Court by e-mail to chiefdeputyclerk@cafc.uscourts.gov. I thought this was an interesting article about software patents in New Zealand (yes, you read that correctly) [Link]. The oral argument recording is available [here]. It did seem odd that the Federal Circuit didn’t conduct oral argument or further briefing in the Apple v. Samsung en banc decision. Others have tried to explain away the decision as being unnecessary for the court’s analysis. The cynic in me thinks that it was to avoid having to recuse any of the majority due to amicus briefing by relatives’ firms. I believe at least three of the Federal Circuit judges have relatives at firms in position to submit amicus briefs. With three recusals, that would have left the vote 4-3 without Judge Hughes’ tenuous “concurrence in the result without opinion.” I’m not sure why Judge Taranto recused himself. That would be interesting to know. 2. The presiding judge assigns the authoring responsibility for each case at the end of each day’s sitting or at the end of a session. If the panel is divided, the authoring role is assigned to a member of the majority. If the presiding judge dissents, assignment will be made by the senior active member of the majority. Because Judge Prost was a dissenter, Judge Newman became the senior active member of the majority. She must have not wanted to write the majority opinion — as odd as that sounds — and assigned the role to Judge Moore. Senator Durbin. Thank you for your answers on that. There is one other element that I always like to reflect on, as a former practicing attorney before a lot of judges, and that is the fact that when you are confirmed, and I hope that you all are soon, you will have a lifetime appointment, and that sometimes leads to a great feeling of independence, as it should. That is the nature of the judiciary. And it sometimes leads to a change in temperament, because folks are not really going to be held accountable as elected officials might be. If you could each address briefly this issue of judicial temperament and give me your idea of what is required of you if you attain this position, I would appreciate it. Judge Scott, if you would start. Senator DURBIN. Thank you. Mr. Dyk, you kind of started at the top here, according to your resume, your first assignment as a clerk in the U.S. Supreme Court to three Justices, including the Chief Justice, so you have seen judicial temperament at many different levels. What are your thoughts about it when you are confirmed? Mr. Dyk. Well, that first experience helped humble me. Senator Durbin, and I completely agree with you. I think it is very, very important for a judge to remember that he or she is a civil servant. That is exactly what judges are. They have a job, just like the postman. The postman delivers the mail. Judges decide cases that come before them. I think if you lose sight of that, you really do not belong on the bench. I think it is absolutely essential to be as courteous as possible to everyone, to remember that you have a job to do, to be a jobist, in Justice Holmes’ words, and to do the best you possibly can at all times and to have people who will keep you humble. I am sure my little league team will help with that. Mr. Dyk. Thank you. Senator. I would like to first thank the committee for giving me a hearing. I appreciate that very much, and just briefly, I would like to say that I regret that my father, Walter Dyk, is not here today. He died a number of years ago and it would have been a privilege to have him. I would like to thank my family and my colleagues from Jones Day and my colleagues for coming here today and I will spare the committee further introductions. Mr. Dyk, let me start with you, if I could. In a 1994 Federalist Society roundtable discussion entitled, “Do We Have a Conservative Supreme Court,” do you recall making statements about Justice Scalia’s plain meaning approach to interpreting laws as being conservative, but a more expansive analysis as being moderate? In your response, you also stated that, “The notion is that Congress speaks only through the words of the statute and that this is a mechanical approach.” You further explain that, “A Senator or a Congressman is much more likely to read the committee report than 559 the legislation itself, so the committee report could actually be more reliable than the words of the statute.” I wonder if you would be so kind as to elaborate on this response. Mr. Dyk. Surely, Senator. I do recall the statement, and obviously, as a subordinate Federal judge, I would follow the Supreme Court’s direction to rely on the plain language primarily. I do agree with that completely. At the same time, I think sometimes cases get into a bit of a dueling dictionary, and under those circumstances, I think it is appropriate often to look at the central purpose of the legislation, as the Supreme Court did, for example, this last term in the Moscarello case involving the question of whether carrying a firearm would include carrying a firearm in the vehicle, and after reviewing the dictionaries and press statements, the Court finally concluded that, yes, it did encompass carrying the firearm in the vehicle because the purpose of the statute was to require the criminal to leave his gun at home. So I do think that statutory purpose and background do have a role to play as to legislative history, but I certainly agree that the primary meaning of the statute is to be gleaned from the plain language that Congress uses. Helsinn v. Teva — Metallizing Engineering “Overruled” by AIA? The Federal Circuit heard oral argument in Helsinn v. Teva on Tuesday. Part of the case deals with whether the enactment of the AIA “overruled” Metallizing Engineering by statute. The panel considering the appeal is comprised of Judges Dyk, O’Malley, and Mayer. It appears from the CAFC web site that Judge Stoll may have recused herself and that Judge Mayer took her place on the panel. You can listen to the oral argument here: [Link]. The USPTO’s position is explained in its amicus brief available [here]. Should the Federal Circuit be Reconfigured to Focus on Intellectual Property Issues? 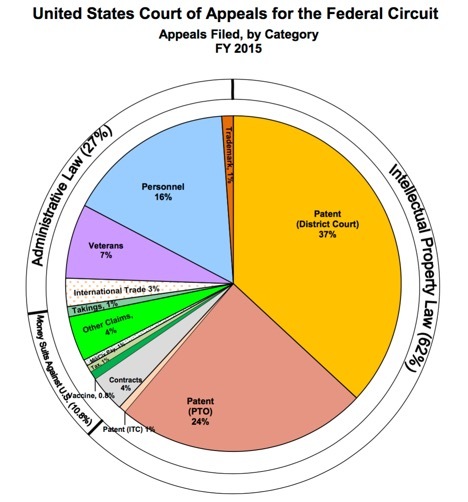 With the advent of the America Invents Act there has been a growth in appeals from the PTAB to the Federal Circuit. 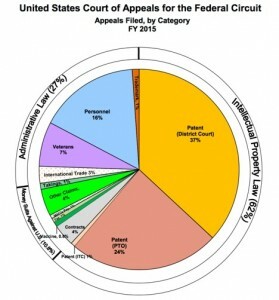 Appeals from the USPTO constituted 24% of the court’s workload in Fiscal Year 2015 — compared to a mere 9% in Fiscal Year 2013! I believe an unintended consequence of the AIA will be not only a growth in workload from the appeals of post-grant proceedings but also a growth in workload from appeals of the PTAB’s ex parte matters. As attorneys become more accustomed to appealing PTAB post-grant decisions, it is only natural that those attorneys will be more likely to apply their skills to appeal a much greater number of ex parte matters than the Federal Circuit has been accustomed to. The growth in workload is already reflected by the apparent increase in Rule 36 Judgments and the growth in the ranks of the USPTO’s Solicitor’s office. I suppose one way to address this growing workload is to expand the CAFC to include more judges. But, does it make sense to add more judges to an already large and frequently fractured court? Would it make more sense to focus the CAFC on intellectual property matters and split off a section of the court as a new court to focus on the other subject areas of the court’s docket? Obviously, it’s debatable. If one were to split the court, what would the two divisions look like? One starting point is to see how the judges break out by technical/non-technical background. It makes sense to keep the non-senior judges having technical backgrounds or district court judicial experience as the ones adjudicating the IP (primarily patent) appeals. Such a group would include judges Newman, Lourie, Moore (Chief Judge), O’Malley, Wallach, Taranto, Chen, and Stoll. The other court would consequently be assigned judges Prost (Chief Judge), Dyk, Reyna, and Hughes. So far, that ratio (8:4) looks appropriate given that the court’s patent, trademark, and ITC docket in 2015 constituted 63% of the court’s total docket. I do think Judge Reyna has brought a fresh perspective to the CAFC’s jurisprudence. It might be worthwhile to swap his expertise with that of Judge Lourie, as a new court would benefit from someone like Judge Lourie with such a great sense of humor. It would be a tough call, though, because both Judge Reyna and Judge Wallach have immense international trade law experience and would provide considerable value to the new court. That leaves only a few senior judges to assign. As a former chief judge, Judge Mayer would provide valuable experience to a new court — plus, he does not seem to be a real fan of oral arguments; so, the new court with its merit cases and limited number of oral arguments would be a good fit for him. As a former assistant US Solicitor General, Judge Bryson would also be a good fit for the new court. Judges Plager, Clevenger, and Schall have a wealth of patent law experience; so, it would make sense to include them in the IP group. Additional positions could be filled on each court by new appointees as workload demands. By pure coincidence, I suspect that this partitioning would have a dramatic effect on reducing the current fractures among the court, e.g., with respect to 35 U.S.C. §101 issues. Pure coincidence. You are currently browsing the 717 Madison Place blog archives for October, 2016.